First a big thank you to the folks over at Kubuntu for putting their time and effort into this latest release. Finally after waiting a while for this latest release of Kubuntu I got around to installing it on one of my computers. The following article wont really be a Review of Kubuntu 6.06 but instead will be my thoughts as a windows user using Kubuntu. Before I get into the good and bad I would like the reader to know that with Kubuntu you have a very large community you can access to help you with problems and or questions about Kubuntu. A lot of people always talk about the Ubuntu forums for answers to a lot of questions and that is a good place to go as well. For me though I have better luck on IRC chat where you can chat to other people. Kubuntu comes with Konversation and that is a IRC client thats already configured to login into the Kubuntu IRC support channel. The only thing you have to do is make sure your connected to a Internet connection and load the Konversation software up and hit the connect button. Once connected you will see a Kubuntu tab just click on that and type in your question. There are a lot of good people in these chat rooms who know loads of stuff about Kubuntu and so far I think I have only had one question that didn't get a answer , most of my questions have been answered in a few minutes. Don't forget to thank these people when you do get a response I'm sure they could be doing other things but are instead in there trying to make the transition to Kubuntu a smooth one for all. The first step of using Kubuntu was going to the www.kubuntu.org web site and getting the ISO image that I could burn to CD. Downloading the ISO image was nice and fast and shortly after I had a CD burned and ready to go. The ISO I downloaded and burned was of the LIVE CD type. For those that don't know a Live CD is basically a full version of the Kubuntu OS that you can put in a CD drive and test out before installing. When running the LIVE CD it does not install itself at all to your system. So you don't have to worry about the LIVE CD messing up your Windows install should you have one. Before I decided to do the install of Kubuntu I decided to use the check CD option on the LIVE CD. This check when run will go through the entire CD and make sure all the files are not corrupt in anyway. This is something I think everyone should do just to make sure their CD isn't corrupt which could lead to problems later on.. The CD I made was error free so I booted the LIVE CD and hit the install to disk icon on the desktop. Next I was looking at the Kubuntu installer that was going to install the OS onto my hard drive. The installer installed Kubuntu in 6 easy steps and it was very much like installing Windows XP which is a good thing. While going through the 6 steps of the installer you setup your time zone and the default language you will use and the like. After getting Kubuntu installed onto my hard drive I popped the LIVE CD out and then rebooted the computer. The next thing you see is the Login screen where you enter your name and password and then the desktop loads up. So after the desktop gets loaded up I start to make my changes and get things to look the way I want them to. This is one thing about the KDE desktop I like is that your not to short on options in terms of how you can make your desktop look. 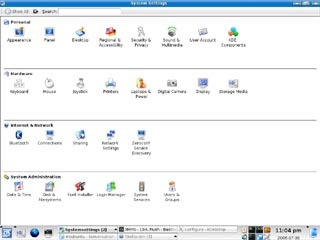 You can have a default look that looks like windows 98 or have have it look like a mac or have a variation of the two. If your not happy with any of the default themes you can go online and find a ton more that are freely available. It was at this point in time I wanted to get rid of the default resolution which was 1600 by 1200. I like my desktop to be 1024 by 768 and so I adjusted the resolution to what I wanted and made a few other changes and then decided I should reboot. Much to my surprise this is the point when I run into my first glitch with Kubuntu , when the computer boots up its in 640 by 480 mode. Now I know I told it 1024 by 768 so I get the desktop properties up and I go in and have a look and its got my maximum resolution set to 640 by 480. I reboot the machine again and I get the same result the computer for whatever reason thinks I can only display 640 by 480. The only thing that saves me with this problem is I have a good idea how to fix it. To fix the problem I have to go in and configure the Xserver and that means you have to load a terminal up and starting typing in some commands to get the Xserver configure screen up. Once I had that screen up I went through the options and a lot of the stuff I left at the default values and I just went through the questions and saved it. Sure enough on the next reboot my system is back to where it should be in terms of resolution. This however does not end the problems I will encounter later on. After finally getting the resolution back I notice when I boot up the login screen still seems to be 1600 by 1200 despite the fact my desktop is clearly in 1024 by 768. As it turns out the only way I have found to fix the login screen resolution is to go back into the Xserver config and tell it my max resolution is 1024 by 768. When I tell Xserver my resolution is 1024 by 768 both the login and the desktop load up at the same resolution. The problem you now end up with is your max desktop res is 1024 by 768 you can't increase that unless you go back into the Xserver and reconfigure that again. There maybe a way around this problem but I didn't find it , I asked numerous people about this and no one had a answer. I also looked on some forums as well and didn't find anything regarding this. If you happen to know how I can have my login screen at 1024 by 768 and be able to set my desk top resolution to above 1024 by 768 without reconfiguring the Xserver I would be interested in hearing about it. In case your wondering why I would want to do this the answer is because there are some apps out there where I may want my screen resolution higher then 1024 by 768 because they require a lot of desktop real estate. It's nice to be able to crank your resolution up when you have to and not have to go through a bunch of stuff to do it. I think the Kubuntu people need to find a way to make it so you only have one place to set the resolution for the entire machine and have that easily accessible. A good example is with windows you have the one resolution slider under desktop properties and that handles all your resolution settings and its easy to get to. After I got the resolution somewhat working my next task was looking into getting the mp3 and video players to work. The reason you have to get them to work is by default Kubuntu don't come with Codecs to support things like MP3 and Divx files. There are a few ways to handle this problem and my way was to download XMMS and VLC. 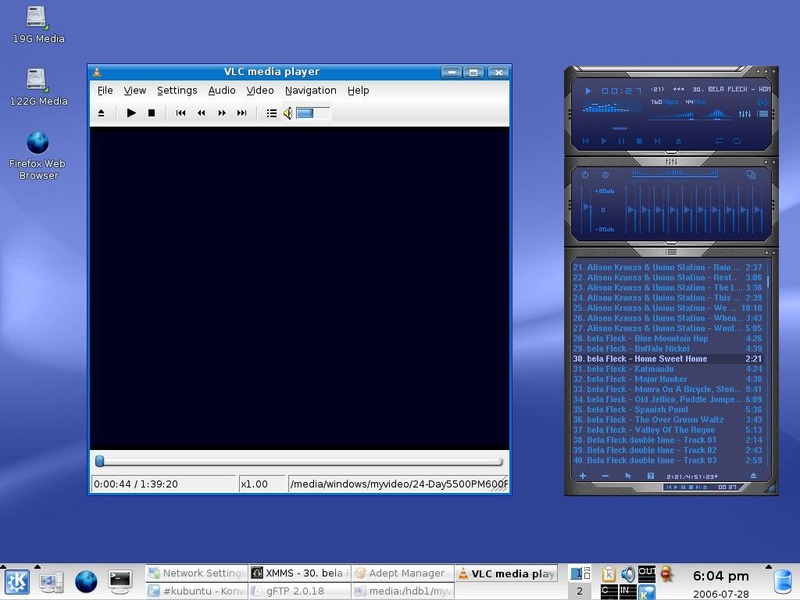 XMMS is a winamp clone as you can see in the screen shot above and VLC is a media player that by default supports a lot of video codecs. Once I had them two programs my multimedia needs were met. Another way to handle codecs is to get your hands on a program called Easy Ubuntu it will install all the codecs you need to handle multimedia and it will also install some other handy software should you want that as well , you can select and deselect what you install. When you install Kubuntu if you have a supported network card and a router it will automatically connect up to the Internet. The only problem with this is you may not know your connected or disconnected because there is no little network icon in the system tray showing you your network activity. This is another thing I wish the Kubuntu people would include in a default install. I don't like having my machine hooked up to the Internet if I'm not using it , and unless I write a script I have to go into the system settings and disable the Internet connection through there after I log on as administrator. Now on to some of the good things.. The first thing I liked about Kubuntu was its a non bloated install. Basically it installs only what it needs and thats it. The reason I like this is it allows me to add to the system what I want to and there for I know what each application is for. I have seen some other distribution's out there that come with loads of stuff already installed , and its a job and half just to go through all the stuff to see whats good and whats not. The other thing I liked about Kubuntu is the load time for the desktop to be displayed really doesn't take that long. I really do like the KDE desktop under Kubuntu there is a lot of power to it and the options to customize things goes on and on. Windows users should be right at home using KDE because much of it functions the way you would expect windows to function. The screen shot above is of the system settings option when loaded looks a lot like the windows control panel. 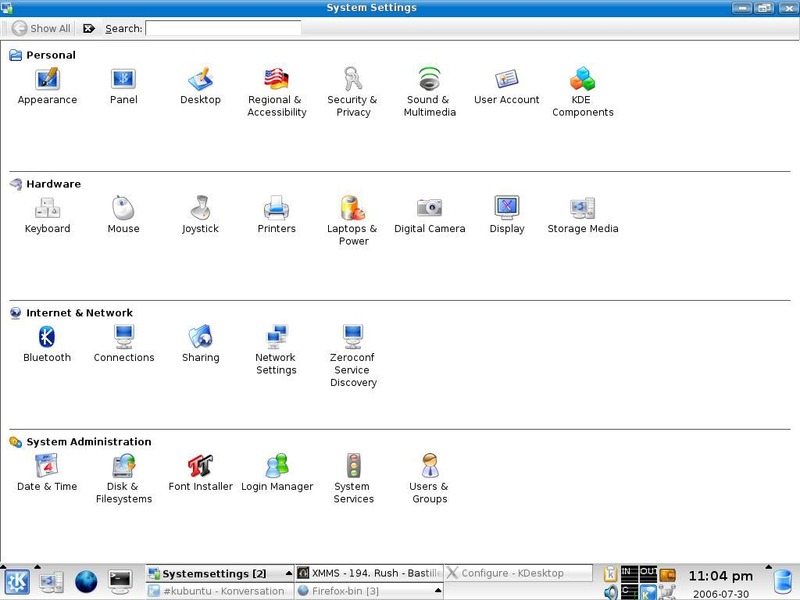 From the system settings you can go in and modify different aspects of the OS. 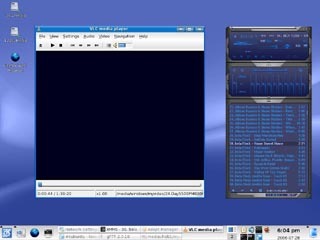 The actual programs that load up under KDE function and look a lot like their windows counter parts. I think the default KDE desktop looks better then any of the windows desktops that i have seen. People that are used to windows will be somewhat used to the Adept package manager shown in the screen shot above since it functions like Microsofts windows update. The difference with Adept though is not only can you get updates for the operating system but it will also keep all the programs you have installed up to date. Keep in mind this only implies to software that you downloaded from the adept repositories. 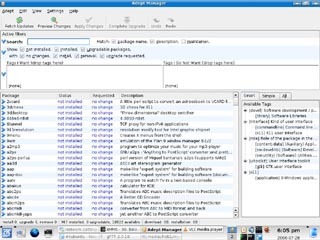 The one cool thing I like about Adept is that you have a search box and with that you can type in names of software your looking for and if that software is part of the repositories it will come up with a match and then you can install the application. The major drawback I see to using Adept is it does not keep track of what it has installed on your system. So for example a lot of Kubuntu applications rely on special library's that get downloaded and with out these library's the software will not run. So an example I had happen was I installed the XMMS mp3 play and I got the program plus a bunch of support library's it needs as well. Problem was when I un-installed XMMS the only thing that was removed was the XMMS player and not the library's that come with it. The partial remove of software really gets on my nerves. When I un-install something I want the whole thing gone not just part of it. After talking to some people on IRC about this I was informed there are other package managers that do keep an eye on everything installed and will remove everything including library's when doing a un-install so at least the user isn't stuck with this problem. Once I got the problems I had sorted out I found the overall system worked really well. In terms of the speed of things I would say its about the same as my XP machine and I don't really notice any difference between the two. One thing I do notice is the hard drive comes on way less under Kubuntu then it does in XP and thats a good thing. There is a lot more of the system I have to dig into since I haven't had it very long , and I do plan on using it as my main Linux distribution for a while so I can learn some more about it. Now that I have mentioned some good and some bad about Kubuntu I would now like to take some time to put out some thoughts on what I have seen since using it. I would like to see future versions of Kubuntu replace windows all together. And I think they could do that if they gave the little things some attention. I think for a lot of windows users who use Kunbuntu they probably don't get why the command line is still in use. It seems like every time I ran into a problem the command line was needed to fix it. The reason I think this is odd to me is because I'm a windows user who hasn't seen a windows command line in about a year. I'm not a big fan of windows to start with but I think you need to look at some of the things windows does and put that into Kubuntu if you plan on trying to get windows users to convert to your software. I think you will get a lot of windows users to switch to Kubuntu if their experience was going to be the same on Kubuntu as it is on windows but without all the windows headaches. I was looking at installing TeamSpeak the other day on Kubuntu and you had to go through a process just to get the thing installed. The sad part is on windows I download the file double click on the .EXE file hit next a few times and the job is done. I don't see why Linux/Kubuntu can't be the same way. I know windows users who may try out Kubuntu but if you mention to them that they have to do a manual install of something that involves the command line they all of sudden want to just pass on it. Windows users don't have to use the command line in windows so I'm sure they don't want to use it in Kubuntu..
At the end of the day I hope these little things get taken care of in future versions of Kubuntu. I would like to be able to do install of Kubuntu and just have things work. I do see a day where this is coming because Linux distributions keep getting better and better. In conclusion I don't think a windows user or any user can go wrong looking into Kubuntu. Sure there are some times when using it you wont have a option but to load up a console and type in some commands but even when you do that its not all that bad. It would be nice if you didn't have to do the console commands but for the time being at least you don't have a choice. The desktop which is powered by KDE always impresses me , them guys are on the right track. The KDE guys are also working on KDE 4.0 which from what I here is supposed to have a lot of changes and I look forward to seeing that. In terms of distributions Kubuntu is the best I have seen yet and I can certainly see why its as popular as it is. So if you got a few hours to spend download the ISO and burn a CD and give Kubuntu a shot and see for your self if its your cup of tea.